There's been a lot of talk about power and energy usage by PCs lately, especially ones on battery. I use an irresponsibly power hungry desktop at home, an Ivy Bridge Intel Lenovo X1 Carbon Touch for work, a Surface 2 (for email, remote desktop (RDP), videos, games and airplane stuff since I don't sweat its batter) and I'm also testing this prototype Haswell that Intel sent me. Whatever machine I get next to replace the X1 Carbon Touch (likely a Yoga 2 Pro) will be a Haswell, and ideally it will support "Connected Standby." Connected Standby is a low-power state that lasts for tens (or hundreds) of hours, but allows the PC to play music, refresh email, and receive VOIP calls. Haswell is amazing, to be clear, but it's all the components working together - chipset, wifi adapter, processor - that make for a truly compelling machine. Recently I re-discovered the powercfg.exe command line tool that's built into Windows. You have this now. It's a funny little tool that, on the one hand, lets you make minute tweaks to how power is used on your computer, but on the other hand, creates the most elaborate reports on how your PC uses power. It'll tell you lots of things about your system that you may not know, or that may help you better use power. For example powercfg /availablesleepstates will tell you the flavors of sleep and standy your PC supports. How deep can your PC sleep? ...for each state and compare the lists of devices. The most powerful (today) sleep state for energy management is Connected Standby also known as ACPI S0. Regular Sleep/Standby on average Win7 and Win8 machines is S3. Connected Standby lets you effectively turn your machine off, but still get email, VOIP calls, play music, etc. There's also rules and guidelines around connected standby that limit battery drain to less than 5% of capacity over a work day. I ran powercfg.exe /a on the prototype Haswell I've been evaluating and it too supports connected standby, which is deeply cool. This explains the fantastic standby ("in the backpack") times I see with it. As more and more machines have Haswell and support Connected Standby, developers will need to support theses "always fresh" scenarios. It's just habit for me to open a laptop before getting on a plane, launch email, load up on RSS feeds, get my flight details. It'll be very cool to have a Haswell machine in "Connected Standby" that is always fresh, even though it may have been asleep all weekend. I recently blogged about how the Windows "High Performance" power profile differed from the "Balanced" profile on Servers' performance. Since I'm not on my desktop machine 24/7, I could save a lot of energy by making sure it's falling asleep at the appropriate time and that it's sleeping as deeply as possible. I ran the Energy Report on my Desktop and it generated a nice HTML report. Here's some highlights (it's super long). First, my desktop isn't configured to ever fall asleep! A fail on my part. The current power plan personality is High Performance when the system is plugged in. Second, my wifi adapter isn't set to use Low-Power. Didn't know that. This device did not enter the USB Selective Suspend state. Processor power management may be prevented when this USB device is not in the Selective Suspend state. Note that this issue will not prevent the system from sleeping. This was extremely useful information for me, so I'll take 5 minutes and make sure this big desktop goes into standby when I'm not around. 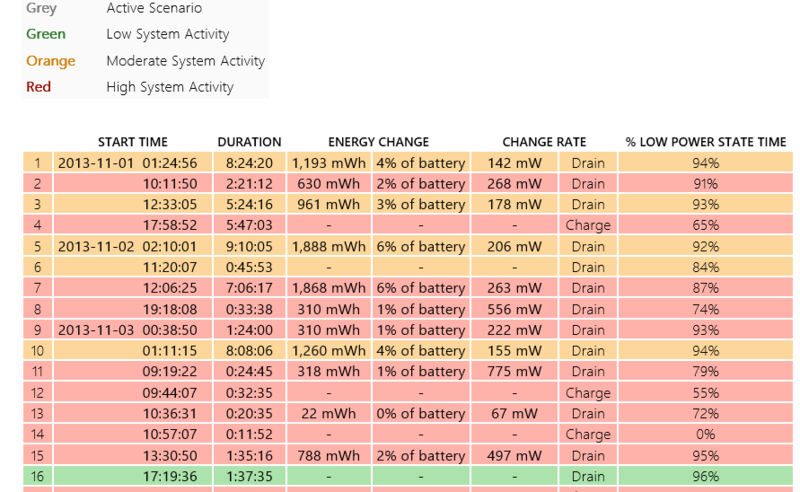 If you run powercfg /batteryreport on a laptop you get a WEALTH of information in an HTML report. Here's some highlights. You get awesome charts showing how you battery discharges, charges, and percentages. As well as detailed usage history, percentage used and hours used. I was a little surprised at the quantity of hard data collected and stored by Windows. Also, when blogs and reviewers do detailed tests on different machines showing battery life and stressed tests, are they running powercfg.exe to ensure all the drivers are working together and haven't been flagged as either power-hungry or energy-stupid? Yet another valuable nugget from you sir, thank you! I'm going to run these on all my machines here and set the states as best I can! PS. Small typo on 2nd paragraph: "[...] , on the one had, [...]" should read "hand"? Mavericks has a cool power usage table showing energy use by app. They advertise that the OS is very careful on how it uses power. I'm not a mac user - but they talk about how the cpu is put to sleep when ever it can be, apparently how they get so many hours out of the macbook air. Excellent article. I've used powercfg in the past to switch hibernate or sleep on and off, but never realised I could get this much detailed information! I would like to see power usage built into task manager similar to what OS X has done. We could as you say have a heat map just like the CPU usage one. http://www.anandtech.com/show/7478/microsoft-surface-pro-2-firmware-update-improves-battery-life. 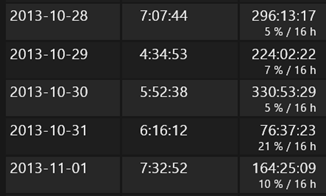 It only takes one poorly optimized driver and your power usage shoots up. That's terrific, Scott. Lets hope Microsoft surfaces this stuff in a more discoverable place and in a more consumer-focussed manner. Battery efficiency is a major topic for consumer devices. We're nerds and we didn't know all this was possible. Interestingly, one of my niggles with Windows RT is the lack of permanent battery indicator. Last night I got a 4% warning and then it shutdown 20 seconds later. This tool might help to answer Jeff Atwood's question: Why does Windows have terrible battery life? My Win7 laptop doesn't seem to recognize the Battery Report Switch. Is this new in Win 8? BTW Scott, aren't you due for Ultimate Developer PC 3.0 ? This is great stuff, Scott. Nice to see that they're still working on improving this utility as machines become more capable in this area. This command shows a list of processes with manual overrides. You use the same command with flags to amend the list. You may need to tailor these modes to suit your individual needs. For myself, I'm not using media sharing on my big 'ol desktop at work, so allowing it to keep my machine up all night isn't a good use of energy. The average processor utilization during the trace was high. The system will consume less power when the average processor utilization is very low. Pretty cool that it makes fancy HTML reports! This is interesting stuff. Thanks, Scott. If -BatteryReport is for 8 only, maybe you should let everyone know. This is one of the most valuable articles I've read in a long time. I always wondered how to analyze batter on my laptop as well as how to prevent it from losing its power in less than 12 months. Great stuff Scott! 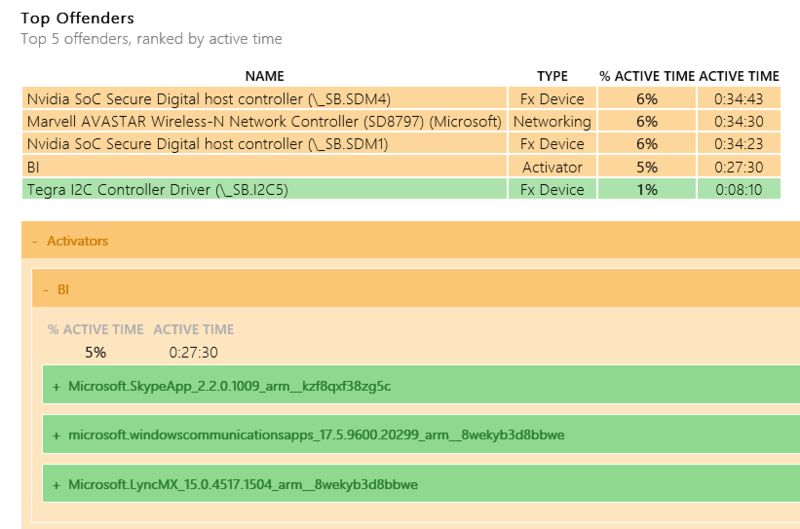 Looking at this, I find very disappointing Surface Pro 2 is not supporting connected standby due to firmware not surpporting it, especially considering than Haswell processors are supposed to support it. Seems like the command that Scott is describing might be a Windows 8 thing. There's a powercfg command for Windows 7, but the switches are different. and you'll get a huge dump of information about available sleep states, peripherals which might be preventing sleep, etc. Scott - you've mentioned the Surface rt/Surface 2 a number of times. I am interested to know where you think it fits in, eg is the idea that you sacrifice breadth of app support in exchange for a cheaper lighter unit? The energy report even told me my Wifi router was not configured to allow my laptop's Wifi adaptor to go into a low power state. Impressive. Matt - Exactly right. I *want* a Pro with the size of an RT. The RT is just the perfect size and weight, and really a LOT more capable than my iPad. For 75% of my work, it's great. Absolutely superb post! Why don't Microsoft put a GUI over that tool? It would improve customer satisfaction no end! This is great. I like it. Thank you very much. yeah the tool is rather epic, i found out that the ASPM states of the usb and Pcie lanes are not used correctly by using powercfg -energy. Some google's later it turns out you can force them to work in windows by using a Grub bootloader. And that saved me 3 watts on idle! from 9 to 6 watts on a Sandy bridge Laptop is just huge. Just goes to show how easy apple has things with a very limited hardware set to make everything power down properly.